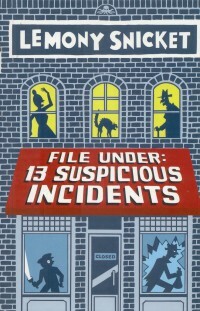 CM Magazine: File Under: 13 Suspicious Incidents. File Under: 13 Suspicious Incidents. Lemony Snicket. Illustrated by Seth. "Lemony Snicket," she was saying to me, "tell me exactly what being an apprentice means." "You and I are in a secret organization," I began, but Theodora looked wildly around the room and shook her head at me. My chaperone's hair was a crazed and woolly mess, so when she looked around the room and shook her head, it was like seeing something go wrong at a mop factory. "Shush," she hissed. "...You shouldn't talk about our secret organization. You shouldn't even say the words 'secret organization' out loud." "You've just said them twice." "It doesn't count if I say them in order to tell you not to say it." "...You and I are in you know what, and being your apprentice means I'm learning all the methods and techniques used by you know what. There are sinister plots afoot in this town, and you and I should be working together to defeat them in the name of you know what." "Wrong," Theodora said. "Being my apprentice means you do everything I say." "That's not what I was told," I said. "You know who," I said, just to be safe, "at you know what, you know where, when and how." "You're talking nonsense," Theodora said. "Breakfast is ready. As your chaperone, I'm telling you to hand me two napkins." "As your apprentice," I said, "I'm telling you we don't have any." "I suppose it doesn't matter," Theodora said, and I suppose she was right. My chaperone made us breakfast every morning on a metal plate provided by the Lost Arms. (...) Theodora had laid two slices of bread on it and then begun arguing with me. Now the bread was burned black on one side, like a shingle covered in tar, and the other side was soft and cold from sitting on the windowsill we used as a refrigerator. A napkin would not turn a half-burned, half-cold piece of bread into a breakfast. A garbage bin would have been more helpful. I put the failed toast in my mouth anyway. Over the sound of burned crusts against my teeth, I heard a knock on the door, and Prosper Lost peeked in at us. "Someone is here to see Lemony Snicket..."
"...I need some help." ... "Follow me to my home, Marguerite said, "and I'll explain everything and poach you an egg besides. ..."
A fluffy poached egg is a good breakfast, and a good breakfast is better than a bad one, like a good book is better than having your toe chopped off. We walked out of the Lost Arms together and down the quiet street. Most of the streets in Stain'd-by-the-Sea were quiet. The town was emptying out. True to form, Lemony Snicket's 'chaperone', which here means 'mentor' or 'adult partner', S. Theodora Markson, is anything but helpful. In fact, in this third book in Daniel Handler's series, "All the Wrong Questions", Lemony's chaperone is almost totally absent. That isn't unusual either. Throughout the series, almost all adults in the dying town are absent, and jobs usually done by adults are being done by children. Accordingly, Lemony's status as someone who is able to help people solve mysteries has spread to such an extent that Stain'd-by-the-Sea's residents now seek him out when they have a problem they can't solve. Even the Mitchums, the town's only police persons, turn to Lemony to help them solve a case Lemony concludes as 'Very Obvious', which the solution is. Most readers will find the solutions to many of the "13 Suspicious Incidents" included in this book fairly obvious. But as always in the 'almost-13-year-old' sleuth's world, bigger mysteries continue to boil below the surface. And while Lemony's adept at solving problems the citizens of Stain'd-by-the-Sea seek his help with, and while he's given a decent report by a 'spy' presumably sent by the aforementioned 'secret organization' to test his progress as an apprentice, the bigger questions and solutions continue to elude and to trouble the boy. "... the whole thing is suspicious." 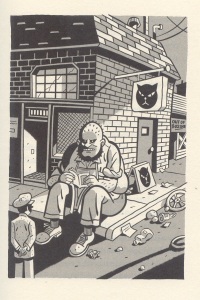 Lemony finally tells Dashiell Qwerty, the town's librarian and the one adult in town Lemony has come to trust. Qwerty cocked his head at me. "The whole thing?" he repeated. "The fog," I said. "The vanished sea, the living forest of seaweed, the island and its bell, the thefts, the disappearances, the kidnappings, the mysteries, the puzzling pieces of a shadowy and fiendish plot with an equally shadowy and perhaps even more fiendish villain." [ The villain referenced here is Hangfire, a decidedly fiendish villain introduced in the first book, "Who Could That Be at This Hour?". ] I paused, not knowing how much of the story I should tell him. Librarians are generally trustworthy people, but part of a librarian's job is to make information available to everyone, and this was information I felt should be kept secret. "All the strange encounters," I finished, "and all the troubling incidents I seem to find in this town." "Do you find them, Snicket? Or do they find you?" "Look at it this way, Snicket," ... "To a stranger in town, such as yourself, Stain'd-by-the-Sea is full of suspicious incidents. But to the people of Stain'd-by-the-Sea, you're a suspicious incident yourself. You arrived out of the blue and live in a hotel suite with an adult who seems to be neither your parent nor your guardian. You ask a lot of questions about anything and everything, and anyone and everyone has questions about you. ... There are rumors you are in charge of an important investigation. But nobody really seems to have the foggiest notion what you're up to." ... "What are you up to, Snicket?" That question Lemony avoids answering, for now. In the ominous murk of the deeper problems in which Lemony Snicket remains mired, what surfaces for readers here, along with solutions to the 13 incidents, are more glimpses of the town via Seth's sophisticated, detailed drawings, this time rendered in black and white, as reports filed from the field regarding cases would be. The resourcefulness and abilities of children left guarding their parents' homes and running their businesses while the parents are off doing something else somewhere else, or are present but unaccounted for, may be accounted for as in the cases of a small boy's very abusive father, a girl's father who refuses to allow his daughter to read, and Snicket's associate and friend, reporter Moxie Mallahan's father who is too ill to be involved in anything Moxie does. Questions about issues such as the homeless who gather in a camp at the edge of town—as the homeless do in most towns—and what happened to the Yamgraz, the shellfishing people who inhabited the place before others came in fishing boats, ink was discovered, the railway that started transporting oysters to the city for fancy parties arrived, and the town of Stain'd-by-the-Sea was established, also come up. And more questions are raised about the issues Lemony has been facing all along and with which he struggles. The format of this book, with its separate incidents and conclusions filed separately at the back of the book in Sub-file B (along with conclusions for which no cases are provided), renders it much slower-paced than either the first or second books in the series. Readers will likely dip into Handler's File Under: 13 Suspicious Incidents a few incidents at a time, perhaps at bedtime. Such reading gives a lot of time for thought, but it does put some distance between the reader and the able and highly moral, if sometimes confused, central character. That said, a lot of novels are read this way, and perhaps the format here simply encourages the reader to more easily set the book aside when it's time for lights out. And to think. "If you're a librarian," Lemony says, "questions are good for business." They are also, I think, very good for novelists and for the readers of their books.